Row by Row! We are so happy to be participating! And we think we've captured Home Sweet Home in Delaware quite nicely. Diamonds for the Diamond State. Peach Blossoms for the state flower, Ladybugs are the state bug and don't forget the Blue Hen is the state bird! Kits will be available for the row as well as a "Finishing Kit" if you'd like to finish yours just like ours. Stop by and check out our Delaware Delight! Row by Row starts June 21st! Here's some of our new fabrics. Daisies in blue jars are back - and going fast! 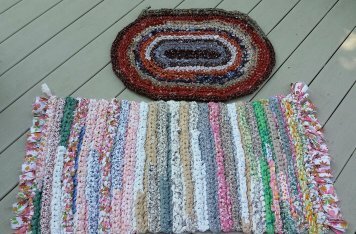 Look how great they work with the Triangle Frenzy Swirl pattern by Bunnie Cleland. 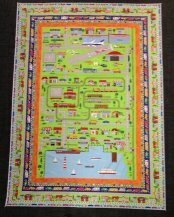 Check out this quilt top made with Connector Playmats - 4 different panels, the harbor, the town, the train station and the airport and all the roads connect no matter how you put them together. Ours features the harbor, airport and the train station. 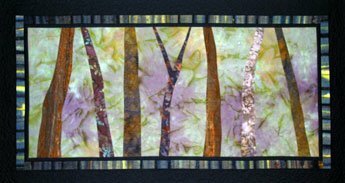 The border is one cool print - the town with a road that wraps around the entire quilt! 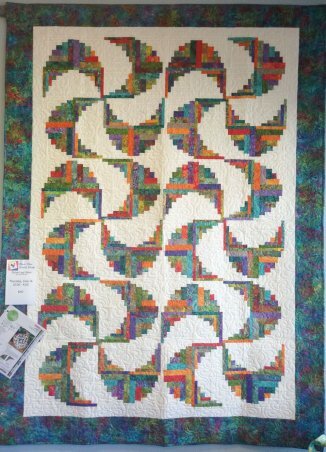 This quilt top is a free pattern for the fabric line - we have a copy just waiting for you! 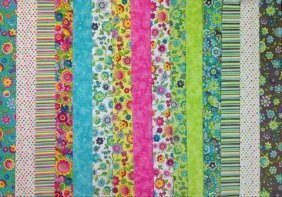 Blossoms - happy flowers, stripes and dots! 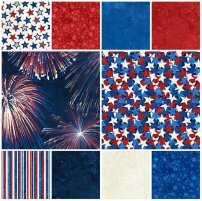 Beautiful red whites and blues from Stonehenge! 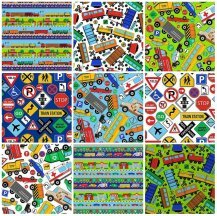 Lots of new patterns have arrived and we are working furiously on a couple of Block of the Month projects that should make their debut soon. 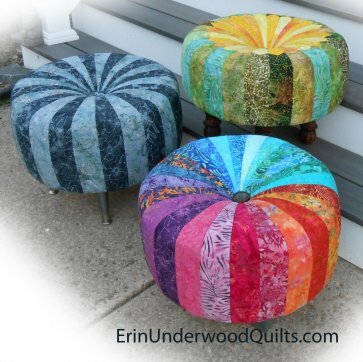 Our class schedule is jam-packed with great projects, techniques and just plain fun. Check out the listing below for the month of June but be sure to make plans in July to attend our week-long Christmas in July! 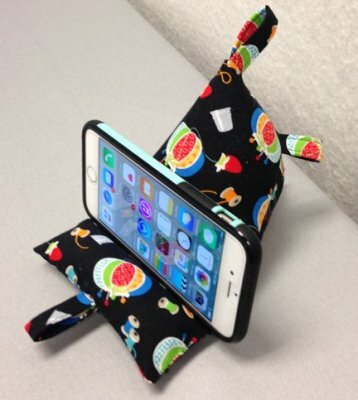 Saturday, June 11th 9:30 - 10:30 (gadget not included ;-) Please call the shop 302-533-5215 to sign up! 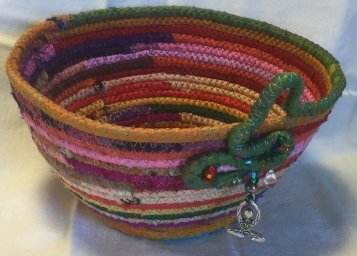 Rope Basket with Jody Beitzel This one is silk but cotton works too! Saturday, June 18th 9:30 – 3:30 $50 Kits available upon request. BEACH WEEKEND starts June 23rd. 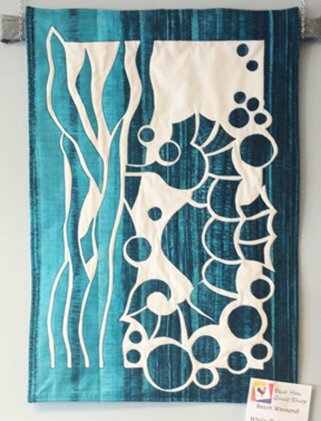 Ocean Frolic with Linda Scholz - rickrack, applique, yo-yos and prairie points! 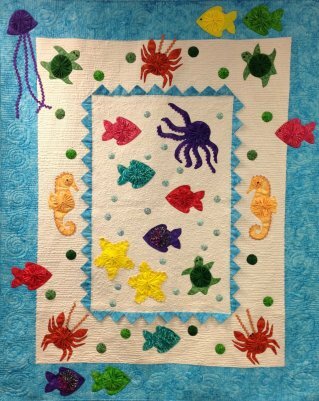 Even if you don't plan on taking this class, come in and check out this quilt! It is amazing! 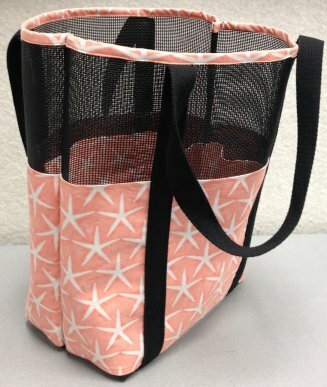 Linda's Beach Bag! Adorable and Fast! 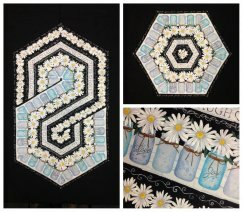 WholeCloth Fusible Applique with Erin Underwood. Okay - its official! We've now been around long enough to have a SALE TABLE! All fabric on the sale table are $5 a yard. And if you finish the bolt, you will still receive that extra 10% off! Out with the old so the new can come in! Come in and check it out - I'm sure you will find something there you need!